It’s amazing how far technology has come in such a short period of time. In little over a quarter of a century it has completely transformed the world we live in. As time passes us by, the idea’s and innovation continue to expand beyond our wildest dreams. We have smart phones that stream the internet using a high speed satellite connection, apps that use more memory to run than the space shuttle program, and integrated circuits that exist at the atomic level. It’s an exciting time for tech junkies of all kinds and now the technology boom is advancing our own homes. A growing trend in technology is emerging, and is becoming more affordable for the average homeowner than ever before. People all over the world are upgrading their homes with technology, installing such items as motorized sun shades, light sensors, and advanced home theater systems with 6.1 surround sound. And now all of these things can be operated using your own voice. Whether it’s your thermostat, lights, appliances, and everything else that you own that is electrical and digital. Imagine getting home from work and telling your thermostat to turn the air on as your lights automatically turn on as they sense your presence in the room. Virtually any electrical utility or appliance in your home can be activated using voice recognition software. All it takes is an inconspicuous microphone or multiple microphones if you want to automate all the rooms, and a central computing unit that can process your requests. You can also have your phone synced to the computer software which will allow you to control your home from your smartphone when you are away from your home. It is even possible to have your system answer questions for you such as what the weather forecast is, and what the traffic report looks like. You may be asking yourself, what happens when you are having a normal conversation inside of your home with someone else? How does the computer know when you are talking to it, and when you are talking to another person? Nothing could be more frustrating than your computer accidentally responding to commands when you are having a casual conversation. Software developers of course considered this dilemma when creating this futuristic technology. The computer will respond to your requests, only when you wake up the system by using an uncommon phrase, and then asking the computer to perform the task you have requested. This technology can greatly enhance your lifestyle and is the future of innovation and technology. Are you interested in voice control home automation? 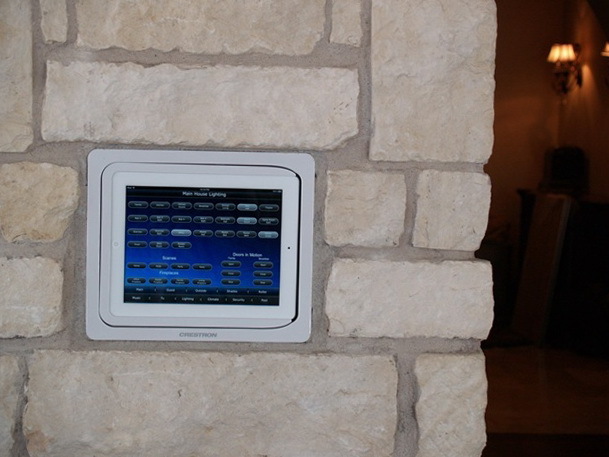 By installing a Crestron home automation system, this can be possible. Creative Sound and Integration can help you decide how you want your home automated, will install and program the system.